If you're looking for a custom wallpaper application with a sense of history, you'll love today's mural. The wall mural image inspiration we're featuring are petroglyphs, which are most commonly attached to prehistoric peoples. Petroglyphs are created by etching or engraving into a rock face, with people and animals being the most often depicted subjects. 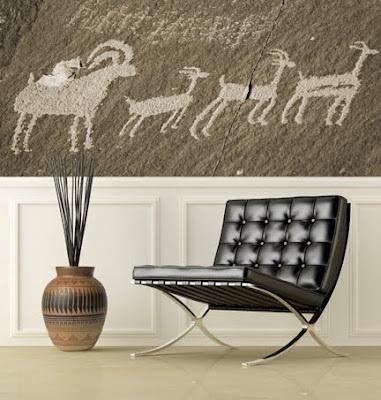 Printed on wallpaper as a wall mural, petroglyphs will effect your room's decor in a number of ways. First, the natural stone background behind the carvings will instantly add an earthy element to your space. Cracks and fissures in the rock printed with photorealistic detail will give the impression of actually being in the presence of real rock. Additionally, the petroglyphs themselves resonate with the past; you can't help but wonder who did the carving and why. The anthropological aspect of this custom wall mural will certainly give your space an academic kick. The Petroglyph National Monument in New Mexico features thousands of engravings, plenty of opportunities to capture your own image for a custom wall mural. If you haven't been there or don't plan to go, contact us for our free image research service. Other artifacts and architecture of ancient peoples may interest you more; from totem poles to ziggurats, history is peppered with countless inspiration points for a custom wall mural.